This online driver safety program (DSP) is approved by the Indiana Bureau of Motor Vehicles (BMV) and can be taken once every three (3) years to get 4 point credit on your driver record. This online driver safety program (DSP) is approved by the Indiana Bureau of Motor Vehicles (BMV) and can be taken to satisfy a couart order to attend a DSP. You will be required to select your court after registration if you choose this reason for attendance. This electronic workbook driver safety program (DSP) is approved by the Indiana Bureau of Motor Vehicles (BMV) and can be taken once every three (3) years to get 4 point credit on your driver record. Vehicles (BMV) and can be taken once every three (3) years to get 4 point credit on your driver record. 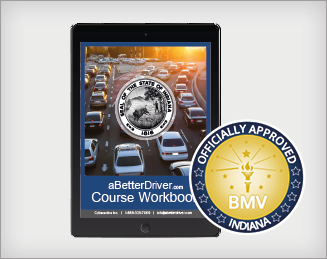 This workbook driver safety program (DSP) is approved by the Indiana Bureau of Motor Vehicles (BMV) and can be taken to satisfy a court order to attend a DSP. You will be required to select your court after registration if you choose this reason for attendance. Whatever reason best fits your needs, ABetterDriver.com can help! Our engaging, interactive and affordable DSP courses come in a variety of formats and may be taken according to your schedule. Best of all, you can take the entire course up until the final exam without paying so if you’re not fully satisfied, you don’t have to pay a dime! Once you successfully complete our DSP course we will electronically notify the BMV of your completion within 3 business days unless you order same day shipping. No hassle, no headache, and no stress! The BMV will process your completion within 7-10 days, so make sure to complete your course with plenty of extra time to allow for this processing time. We have included a brief description of the program requirements for each of the four attendance reasons. Register for and complete the ABetterDriver.com DSP (internet, streaming video or DVD). We will notify the BMV of your completion within 3 business days unless you order Same Day Processing. It will generally take at least 10 days for the 4-point safe driver credit to appear on your Indiana driver record. Since this program involves reducing points on your driver record that are associated with a court-issued ticket or tickets, you must contact your court prior to enrollment and verify that you are eligible for this program. 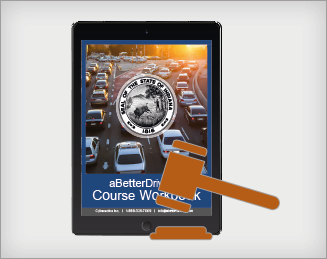 Enroll in and pass the ABetterDriver.com DSP (internet, streaming video or DVD). We will electronically alert the Bureau of Motor Vehicles of your completion within 3 business days unless you order same day processing. It will take at least 10 days for the BMV to process your completion and for the 4-point reduction to appear on your record. Appear in court on your scheduled court date. 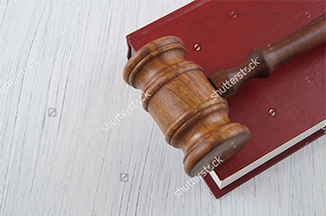 The presiding Judge will give you the option to attend a DSP and the date by which the DSP must be completed. Sign-up for and finish our internet, streaming video or DVD driver safety course at least 10 or more days before your completion deadline. Once you have passed the DSP, we will send an electronic notification to the B.M.V. within 3 business days. It will take at least 10 days for the BMV to process your completion and give you credit for attending the course. Make sure that your insurance company offers an insurance reduction for attending an Indiana DSP course. Order our internet, streaming video or DVD driver safety course. Pass the final exam at the end of the course and we will ship a certificate of completion to your mailing address. Present your certificate of completion to your insurance carrier and get a discount! I have already registered. How do I login? The “Student Login” button is located in the top right-hand corner of this page and our Homepage. This will take you directly to the login page. Enter your username and password to access your account information, including course materials. Uh-oh! I forgot my password/username. How do I retrieve my login information? Don’t worry, we are here to help! Click here to have your information emailed to you. How long will it take for my certificate to reach me? Notification of your completion will be transmitted directly to the Bureau of Motor Vehicles (BMV) within 3 business days of your completion. Please allow 7 to 10 business days for the BMV to apply your completion to your record. If you would like your completion information processed faster, please order the “Same Day Processing” upgrade and we will notify the BMV the same day that you complete the course. How do I get a copy of my certificate? If you have been instructed to attend this course by a Judge or Court, we will also send your course completion certificate directly to you. Depending on the time of day you finish the course, your certificate will either be sent the same day or the next business day. You can choose to have your certificate sent via regular US Mail, by FedEx Overnight, Second-Day, or Third Day Delivery when you register. Please note that FedEx does not deliver on weekends. You must sign and date your certificate. You are then responsible for delivering your certificate to the court. How can I find the most up-to-date information on when I will receive my certificate? For your convenience, you may track your certificate’s arrival. To do this, just log into the “Student Login” section with your username and password. We will also send you an email once your certificate has been processed, and another one once it has been shipped! Will I have to verify my identity during the DSP course? Yes. During online registration you will asked 10 personal validation questions . These questions will be asked at random intervals during the course and are designed to ensure that you are the only person taking this course. If you fail to answer three (3) validation questions correctly, you will then be required to use voice biometrics to verify your identity for the remainder of the course. If you are required to use voice biometrics as a result of failing three (3) validation question, you will be prompted to call a toll-free telephone number to record a voice sample. At random intervals during the course, you will be asked to call again to verify your voice against the voice sample on record. If your voice sample does not match the voice sample on record, you will not be allowed to continue the course until a successful match is obtained. If you fail to validate your voice sample three (3) times, your account will be suspended. Finally, you will be required to verify your identity prior to taking the final exam using LexisNexis, one of the nation’s most reputable identity verification service companies. LexisNexis will draw upon publicly available information, such as utility and property tax records, and ask you a series of questions based upon that information. You must answer all of the questions correctly in order to take the final exam. If LexisNexis is unable to draw enough information to ask these questions, you will be required to download, print and have notarized an affidavit under penalty of perjury that you are not getting assistance from any other person while taking the final exam. How many chances will I have to pass the final exam? Once we have verified your identity via an independent source, Lexis Nexis, as described above, you will be required to take a final exam that consists of 30 questions that are either multiple choice or true and false. You must answer 80% of the questions correctly in order to pass. If you don’t pass, you can re-take the exam two (2) additional times before your account will be disabled and marked as failed. If your account is disabled and marked as failed, you have the option of re-enrolling in the course again as long as you have at least 10 days before your due date remaining. The Indiana Bureau of Motor Vehicles (BMV) requires that you spend at least four (4) hours taking this course. This is a requirement for all approved Indiana online driver improvement courses. You must spend the minimum required time on each lesson page before you will be allowed to proceed to the next page. You must complete your course within 10 days of your due date in order to allow sufficient time for the BMV to process your completion. If you do not complete your course within this time, your account will be disabled and marked as failed. What methods may I use for payment?